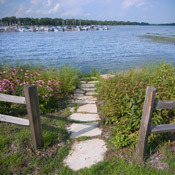 If you own property along a shoreline, you have a unique opportunity to protect and improve the quality of Minnesota’s lakes and rivers. Here are two important things shoreline owners can do in 2013. For those who don't own shoreline property, remember that you can still help our water in many ways. Try our ideas for your lawn and garden or volunteering. You can also make sure your local officials are aware of their responsibility to protect public resources like our groundwater, lakes, and streams. Residents in areas without access to public sewer systems maintain their own septic systems. A poorly functioning septic system is a threat to human health and the environment because it may not remove pathogens, nutrients, and other chemicals from the used water before it enters our groundwater or lakes. Understand your system. 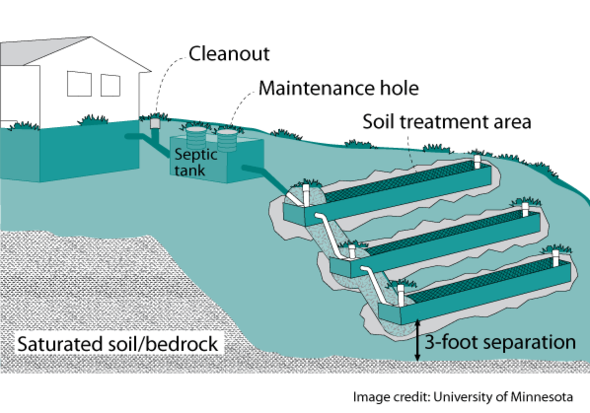 A septic system has three parts: household plumbing, a tank to collect sewage and solids, and a soil treatment area. All three parts must be working to provide effective sewage treatment. Don’t make assumptions. Many septic system owners incorrectly assume that as long as their used water “goes away,” their system must be working properly. Septic systems must be designed specifically for your site’s conditions and installed correctly. Only regular maintenance and evaluation of the system can ensure that it is actually treating your sewage. Look for symptoms of a poorly functioning septic system. These include a pipe that goes directly to the lake or ground (even laundry water! ), sewage surfacing in the yard or a ditch, sewage odors, high levels of nitrates or coliform bacteria in well water tests, or algae blooms and excessive plant growth in nearby ponds or lakes. Manage your system. 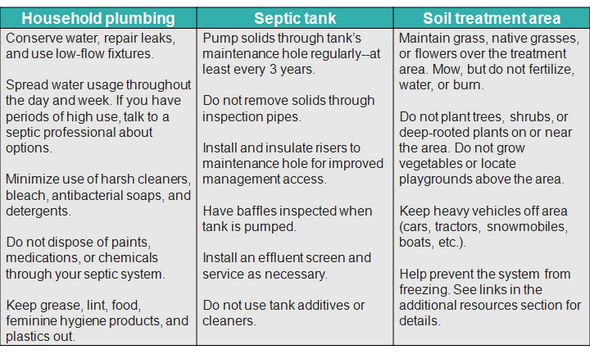 These operation and maintenance guidelines will prevent costly repairs or premature replacement of your septic system. Hire a licensed professional to help you. The MPCA maintains a list of professionals currently licensed by the state to conduct this specialized work. Interview your septic system professional and learn about how they do business. Make sure they are licensed, reputable, and reliable by asking for and checking references. A natural shoreline will protect the bank from erosion, catch and filter run off from the yard, provide shade over shallow water, create habitat, and add beauty. Because of these benefits, natural shorelines reduce nutrient pollution and algae blooms in your lake too! Creating a natural shoreline doesn’t mean cutting out recreational uses or a view from the deck, but it does mean that you’ll intentionally decide how and where you should increase the number of trees, shrubs, grasses, and flowers on your lot. A natural Minnesota shoreline may include a mix of live and dead trees, shrubs, wildflowers, grasses, and rocks. Some shorelines have natural sand covering most or a portion of the site. Make a plan. The Minnesota DNR has an online tool called Restore your Shore that steps you through the entire process. Look for assistance. Residents and cabin owners should inquire about available assistance from their local lake association or watershed district. 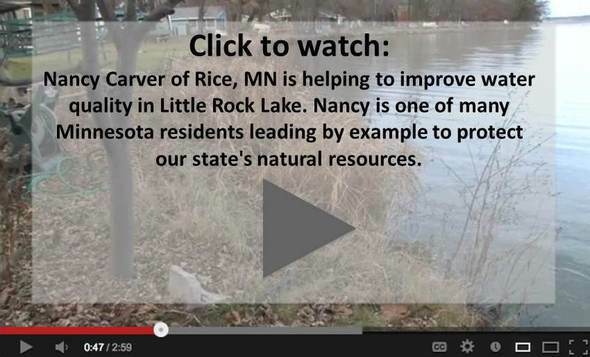 Minnesota DNR Lakescaping and Shoreline restoration page: planning tools and examples. Minnesota DNR Landscaping with Native Plants page: garden designs & native plant suppliers. Blue Thumb: resources to create native gardens, rain gardens, and shoreline stabilization. Join Northland Bioneers and Do It Green! Minnesota for free showings of recorded keynote presentations from the 2012 Bioneers Conference, January 16, February 27, March 20, April 17, May 15, and June 19, potluck and networking at 6:30 p.m. and films at 7 p.m., Midtown Global Market lower level conference room (Minneapolis). Consider new ideas for your lawn at the Minnesota Landscape Arboretum's Sustainable Yard series. Topics include lawn and turf, perennials, trees and shrubs, and the edible landscape. January 26 and February 2, 9, &16, 1-2:30 p.m. (Chaska). The University of Minnesota's Institute on the Environment is hosting a free lecture series this spring. The next presentation is about natural gas hydraulic fracturing--also known as fracking, February 13, noon-1 p.m., U of M Learning and Environmental Science building (St. Paul). The CERTs 2013 Conference: Community-Driven Clean Energy will be an exploration and celebration of successful energy efficiency and renewable energy projects, and a coming together of hundreds of amazing people who are working to create a clean energy future in their communities and beyond, February 21-22, River's Edge Convention Center (St. Cloud).